A placard at the recent protest march following the tragic death of Savita Halappanavar read “How About This For A Gathering, Enda!”. Without wishing in any way to trivialise the outpouring of anger and sadness following this death in Galway, that placard highlighted perfectly what a gathering should be and what ‘THE Gathering” is not. When the idea of this national push to attract visitors and particularly those with Irish heritage back to Ireland was first mooted I thought “brilliant... finally we have someone thinking creatively about solutions to our economic crisis.” I looked forward to seeing how the campaign would develop and what innovative elements Failte Ireland would put in place to make a trip ‘home’ worth doing in 2013. To coin that modern phrase which I hate... I was curious to see how they would ‘add value’ to a trip to the auld sod. A tour of the site made it clear that this was a kind of DIY deal. We, the people of Ireland, most of whom are at the pin of our collar making ends meet, are expected to invite long lost relatives to visit and lay on an event or entertainment as required. Oh yes, Marketing Boy Wonder is right. The Gathering is genius alright. But, although I agree that we Irish love a party and a get together, I think that in our Post Celtic Tiger landscape Irish people also like to feel they are getting good value for money, don't like to be patronised and have a very keen radar when we are being taken for a bit of a ride! And that holds true for the Irish Diaspora too, as articulated recently by the gorgeous poetic Gabriel Byrne (and yes, I am a woman of a certain age). But to me there is something missing from The Gathering. Surely there should be a real hook, an offer of something more tangible than just “we are issuing an invitation, so come on over”. Why have we not offered perhaps a discount on hotel rates or into some of our national attractions or extra air miles if you are flying into Ireland and staying for more than a week? Maybe I am wrong but on closer inspection The Gathering seems, to me, like a half baked idea. 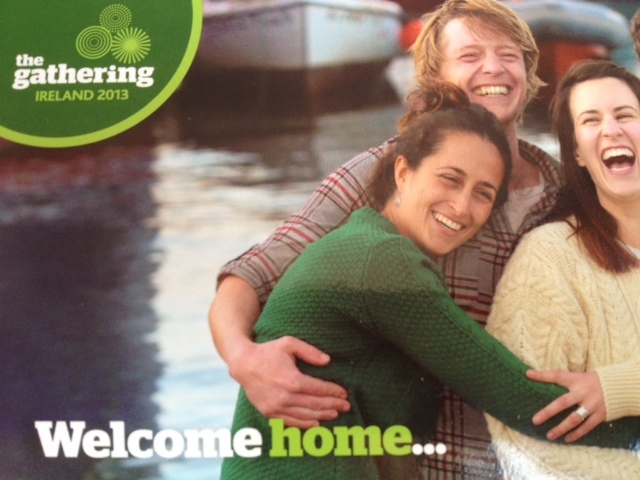 Last week I got my glossy ‘The Gathering’ (remember hear it a la Ms Flanagan) postcards so that I could invite all and sundry kind of long lost relative home for a visit next year. You know what... if I wanted to entertain guests in 2013 I would probably opt for taking a foreign student or two, who would require little entertaining and for whom I would get paid. Now, please don't get me wrong. I love my country and think it really one of the best places in the world to visit. I think we have lots and lots to offer the tourist be they with or without Irish roots. And I think Failte Ireland has done a great job in promoting Ireland as a destination. But I am with whoever held up that banner at the Savita protest. A proper Gathering has to have a reason, has to have soul and meaning. For me, the only Gathering I am having does not require a postcard invitation. Like hopefully many, many other families in Ireland my only ‘Gathering’ will be when I welcome home my eldest daughter from Perth to spend Christmas with her family! If she spends money while she is here, great... but wouldn’t it be better if she, like thousands others, were here paying tax.. every week and not just for Christmas! The Gathering, much like that bloody book 50 Shades of Grey is yet another example of the triumph of hype over substance! This is really interesting, Barbara, and says a lot about marketing. People are not gullible, maybe at first, but get smart fast, and will leave in droves if they aren't getting value for their time or money. I like your idea of the organization matching with hotel and airfare discounts. Seems like a cop out just to tell the Irish people to invite your relatives to stay and spend money here and in exchange we will post about it on our website. It's disappointing. They make a big build up and we are expected to do the work. That's why we are tired of this kind of thing. We have to pay for the mistakes of the past and now we are to pay for the economy of the future. I'm self employed. I have four kids and my husband is a stay at home dad. I am tied to the post and nobody helps me out - I've been turned down the support I thought I needed and I have to make it work myself. Thankfully I can do just about that. But no more than that. I'd rather they donated the money they spent on marketing to the country's tax budget to take a little off of our shoulders. Thanks Barbara, you say what's on all of our minds. Yes I agree with you Abby, it's really very tiring and I am sick too of this. Barbara nice Blog, there was I thinking I was becoming a cranky old fart and had started biting my lip. When Gabriel Byrne put words to my thoughts I developed a smirk, or a rye smile. I attended a few exploratory meetings re possible Gathering events, genuinely felt they had lost the plot, no strategic thinking and a competition to see who could outdo the other, the object of the exercise seemed to have been lost in translation. I am sure there will be some good events and I hope something positive comes out of it, God knows we all need a lift but for now I will stand with my friend Gabriel and hope we don't embarrass ourselves. I must let the hair grow a little and start speaking in poetic tones, although being from Cork I thought I already did ! As an Irish woman living I the UK, I couldn't agree more. People at home and overseas are all struggling to keep body and soul together and I do resent the turning to those of us who will visit family in 2013 as some sort of means for economic gain and once again offering nothing in return. How about a vote in presidential elections for all Irish citizens wherever we are? I do agree that the idea may be somewhat half baked, but as a county we are in an enviable position in that we can do this sort of thing, and people will come. Not too many countries have the ability to reach out to millions of diaspora and expect a good amount to show up. So why not do it in a time of need?